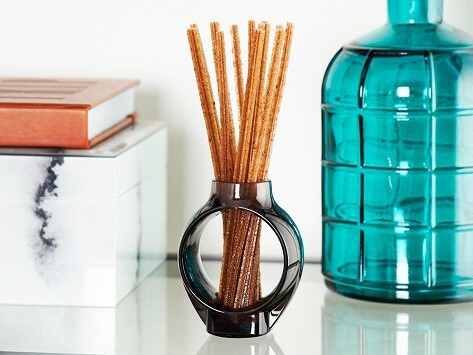 This odor neutralizer reed diffuser is an oil-, flame-, and mess-free way to absorb unwanted smells. The reeds are made with Auracell, a natural polymer made from sustainably harvested and locally sourced trees. They are infused with neutralizer and subtle fragrances suited for small spaces like the kitchen or bathroom. Set them in their vase or pop in a drawer or inside shoes. Made in the USA. Dimensions: Reed tube of 15: 6.5" x 1" diameter; Vase: 1.5" x 3" x 3.5"
It’s been a month now. Still working well. I like the cedar & teak scent best. Really works to eliminate odors. At first I thought something was wrong. I couldn't smell anything. But that's the beauty of this product. You smell no potty odors! No lingering smells, period. After a while I did begin to notice a very subtle scent of...nice! I must admit I was sceptical, but it really works. A VERY subtle scent really delivers. I don't have Windows in this bathroom, so odors tend to linger. No more! !